See the grandeur of Germany with a scenic river cruise through its most picturesque destinations along the Main and Rhine Rivers. Embark on your Avalon Suite Ship® in Nuremberg, and sail to Bamberg for a guided walking tour of the historic home to imperial dynasties. Your enchanting river cruise continues to Würzburg—the “Pearl of the Ro-mantic Road.” From here sail to Frankfurt, where you can join a guided sightseeing tour of the city, or visit the near-by town of Seligenstadt. On your way to Rüdesheim enjoy a sailing through the picturesque views of Wachau Valley. Then cruise to Strasbourg and join a guided city tour of Strasbourg’s sights, such as the stunning stained-glass of its gothic cathedral, the astronomical clock, and La Petite France district. Your scenic cruise through Europe includes a stop in Breisach to visit Germany’s beautiful Black Forest region. Choose a visit to Badischer Winzerkeller, or a day trip to the Black Forest’s Vogtsbauernhof open-air museum, and more. 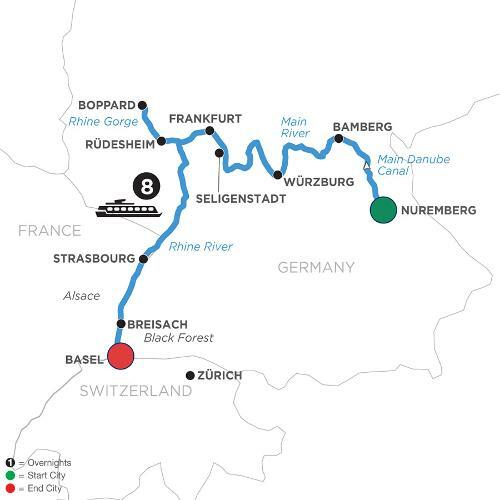 Your river cruise on the Rhine and Main Riv-ers comes to an end in Basel, Switzerland, but your memories of this tremendous adventure through many of Eu-rope’s most beautiful destinations will last a lifetime.